Turns out, when BGs drop, the body produces a chemical that dogs can detect through smell. This discovery is predicted to change the way those living with Diabetes diagnose and treat low BGs. Cool discovery and good news for the diabetes community. This is a fun perspective on the highs and lows of the T1 life by a young woman who lives it every day. Given that Nick Jonas is also an advocate for T1, I think he’d approve. Coaching an athlete with T1D? This post’s for you! 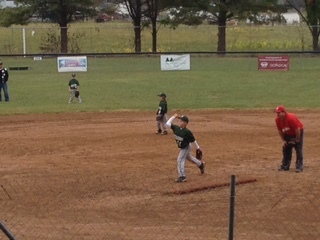 Cole pitching for the first time during fall ball. Cole was a pretty active kid before his diagnosis, but now that we know exercise makes insulin “work” better, we keep him active all year long–spring and fall baseball, basketball, swim team, and archery. Less than a week after his diagnosis in Summer 2013, he was back in the pool, competing in a swim meet (yes, I was a nervous wreck!). We were fortunate because his swim coach was familiar with the disease and did all she could to ensure Cole was safe. But not all the coaches we had were that caring. Most have fallen somewhere between mildly accommodating and indifferent. Thankfully, no one has been outright unsupportive (though I do think his baseball coach this spring was less than thrilled when I told him Cole could not slide into base because he’d rip his CGM out). I don’t think these are bad coaches…they just don’t know anything about Type 1 Diabetes, and many likely confuse the disease with its more vilified namesake, Type 2 Diabetes. I’ve started giving my son’s coaches an information sheet on Type 1 and a list of tips for coaching an athlete with Type 1 Diabetes. Here’s what I include on the sheet. Type 1 Diabetes (T1D) or Juvenile Diabetes is caused by an autoimmune response in which the white blood cells attack healthy beta cells in the pancreas, eventually destroying all pancreatic function, including the ability of the pancreas to produce insulin. Individuals with T1D must rely on insulin therapy to live—this includes injecting or pumping insulin throughout the day. The disease most often strikes in childhood through early adulthood. It is NOT caused by lifestyle or obesity. Managing T1D involves monitoring blood glucose levels numerous times a day to avoid hyper and hypoglycemia. Hyperglycemia occurs when the glucose levels in the bloodstream are too high. It might result from a problem with insulin delivery, miscalculation of or a missed insulin dose, or eating a meal that is high in fat (which slows the processing of carbs). Symptoms of hyperglycemia include headaches, fatigue, irritability, frequent urination, and extreme thirst. If not treated, hyperglycemia can lead to ketoacidosis—a condition in which the high levels of glucose in the blood make the blood acidic. Ketoacidosis can occur after only a few hours of elevated glucose levels, and if left untreated, can lead to seizure, kidney failure, brain damage, and more. Hypoglycemia, or low blood sugar, has more dire short-term consequences for those living with T1D. Hypoglycemia may be caused by increased activity level (exercise makes the body process insulin more quickly), or a miscalculated insulin dose. Symptoms include weakness, headache, loss of motor coordination, hunger, fatigue, and blurred vision. Hypoglycemia requires immediate treatment, such as drinking juice, eating candy or something sweet, or taking glucose tablets. If left untreated, a diabetic experiencing hypoglycemia can pass out, have a seizure, or even die. Medical technology has made the management of Type 1 Diabetes easier than ever before. Insulin pumps can be worn on the body and drip insulin constantly throughout the day and night. Some pumps, such as the Omnipod, can be worn 24/7, including while in water. Continuous Glucose Monitors (CGMs) are also worn on the body and take live blood glucose readings every five minutes. The reading is transmitted wirelessly to a receiver, which also shows trends such as falling or rising blood glucose levels. CGMs are not perfect and readings are generally about 5 minutes behind. In children, readings tend to be delayed more simply because glucose levels can drop or rise quickly (more than 5 mg/dL per minute). There is no cure for T1D, but medical technology makes living with the disease as unobtrusive as possible. Still, there is no substitute for vigilant monitoring and good disease management. This includes eating a healthy, balanced diet, getting plenty of exercise, monitoring blood glucose levels regularly, and injecting or pumping insulin daily. Educate yourself about T1D! Some great resources include the American Diabetes Association website, Juvenile Diabetes Research Foundation website, and the Diabetes Research Institute website. Understand that your athlete will need to check his/her BG before, frequently during, and after exercise. Provide a designated space for the athlete to keep his/her glucose monitoring and treatment supplies during practices and games. Make sure your athlete stays hydrated—diabetics are prone to dehydration, which can lead to ketoacidosis, even with normal BG levels. Talk to your athlete and his/her parents to learn how they are managing the disease. Find out if the athlete uses an insulin pump or CGM. Ask about how activity level affects the athlete. Discuss the athlete’s symptoms of hypoglycemia. Ask your athlete how you can support him/her!